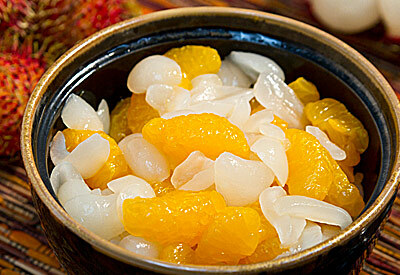 In a bowl combine Rambutan, mandarin oranges, orange juice, sugar, lemon juice and minced ginger. Stir gently to combine. Cover and chill until time to serve. Serve as a salad spooned over fresh chopped lettuce. Garnish with fresh mint. As a dessert, spoon fruit on top of vanilla ice cream and garnish with fresh mint.